Delta Info: We provide two Futures portfolios for ODAT. 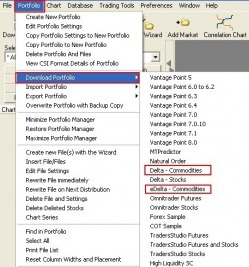 The first portfolio is called Delta-Commodities, and shows up in the root directory (C:\) as Delta-Futures. This portfolio contains Pit, Electronic and Combined (Pit & Electronic) sessions. The second portfolio is called eDelta-Commodities and shows up in the root directory (C:\) as eDelta-Futures. This portfolio contains ONLY Electronic and Combined (Pit & Electronic) sessions. Go to your Desktop and double click the icon “Launch UA”. Select “Portfolio” from the main menu bar. Select “Download Latest Vendor Portfolio” or “Download Portfolio” from the “PORTFOLIO” menu. Select “Delta-Commodities” or “eDelta-Commodities” from the menu. Click “Yes” if it asks “Would you like to download the latest portfolio?”. Choose “PORTFOLIO” from the main menu and click “Select All”. Select “Portfolio” again, and choose “Rewrite File Immediately”. Wait for the program to finish rewriting. Go back to your Desktop and double click the icon “Delta Commodities”. Select “Data Type…” from the “File” menu. 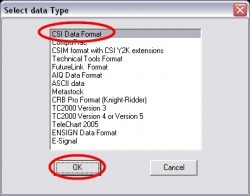 Select “CSI Data Format” from the “Select data Type” window, and click the “OK” button. 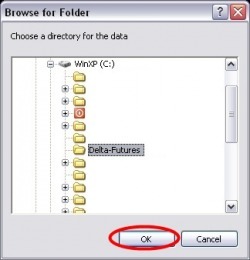 Select the folder “Delta-Futures” or “eDelta-Futures” from the “Browse for Folder” window, and click the “OK” button. Click the “All” button to import all symbols to Delta, and click the “OK” button. Select the contract from the drop down box. Add one or more symbol(s) to the Delta (One Day At A Time) portfolio through CSI’s Unfair Advantage software. Click the drop down box “SELECT PORTFOLIO” and select the Delta-Futures portfolio. Click the button “Add File To Portfolio”. That opens a window called “Selecting Data Series”. Click the IFG tab, select the number of contracts you wish to observe, type in the symbol or csi number (i.e. PA2) and click the “OK” button. Click the “YES” button to build the hard disk files. Follow STEP 3 to add the same symbol with a Nth Nearest contract or Back Adjusted contract. Click the Nth Nearest tab, type in the symbol or csi number (i.e. PA2) and click the “OK” button. Click “FILE” along the top and select “Data Type…” from the “File” menu. Select “CSI Data Format” from the “Select data Type” window. 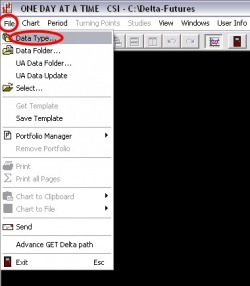 Select the folder “Delta-Futures” from the “Browse for Folder” window. Click the “All” button to import all symbols to Delta.